Santa Pau is in the province of Girona in the Catalonia region of Spain. 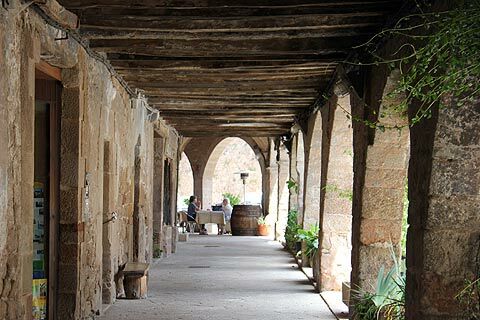 Santa Pau is a picturesque village at the centre of the volcanic Baixa Garrotxa region. There are some excellent walks into the Parc Natural de la Zona Volcanica de la Garrotxa from close to the village. 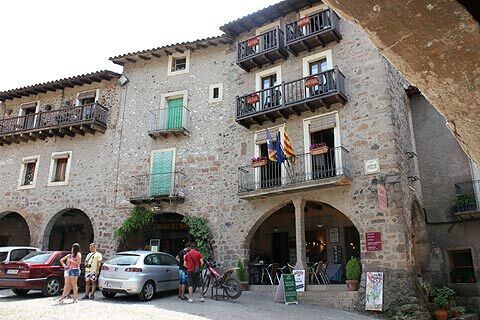 Santa Pau is a very attractive small village. Its main square, the 13th century Placa Major is surrounded by arcaded stone buidings and is also home to the Romanesque church of Santa Maria. Santa Pau grew up around its castle and the Placa Major was once an important cattle market - 'El Firal dels Bous'. The 16th century church of Santa Maria is light and airy inside with walls painted in white but the edges of the arches left in grey stone emphasising the arched interiour. The alter is large and golden as is common in churches in the area. 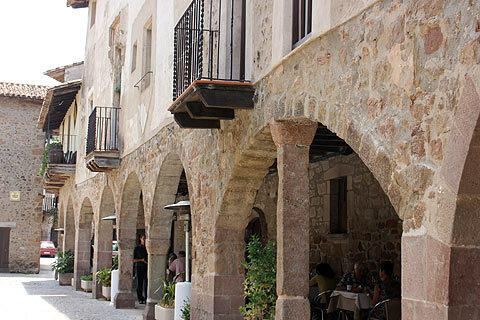 There is a little cafe on the main square where you can stop for a drink and savour the atmosphere from under the lovely arched stone arcades. They also have a cake shop and do a particularly nice cheesecake! Just off the Placa Major on an adjoining square is a fine looking restaurant - again with tables under the arches allowing diners to really savour the atmosphere of this lovely village. 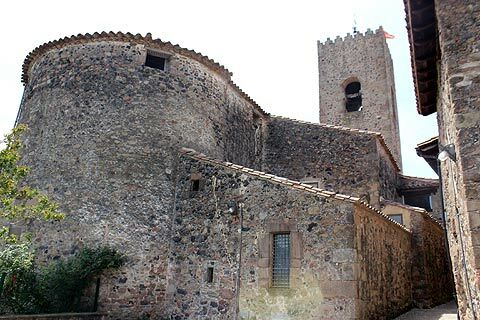 Santa Pau is in the heart of the Volcanic area of Baixa Garrotxa and there are various walks that can be done in the area to discover the volcanic craters. The Volca Santa Margarida has a huge round crater and together with the Croscat and the Rocanegra volcanoes are the most distinctive in the area. Pick up a map from the tourist office for walks to the craters of Volca Santa Margarida and Volca del Croscat. If you have time there is also a huge beech wood close to Santa Pau with a couple of walking trails in it. In the opposite direction there is a lovely section of river with waterfalls and a pool - the 'Salt de Can Battle' - a lovely spot for a picnic. If you are feeling adventurous you can take a hot air balloon ride over the volcanoes and the village or take a land-rover trip or horse riding trip in the area. The tourist office has details. 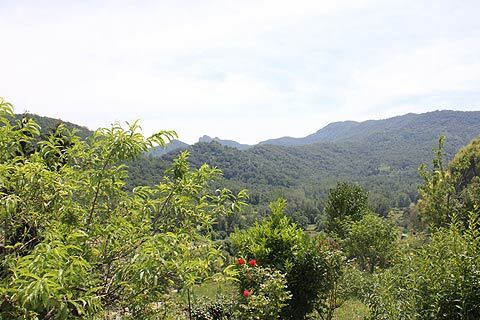 The nearby town of Olot also makes a good base for visiting this lovely volcanic region. Don't miss the wonderful medieval village of Besalu.